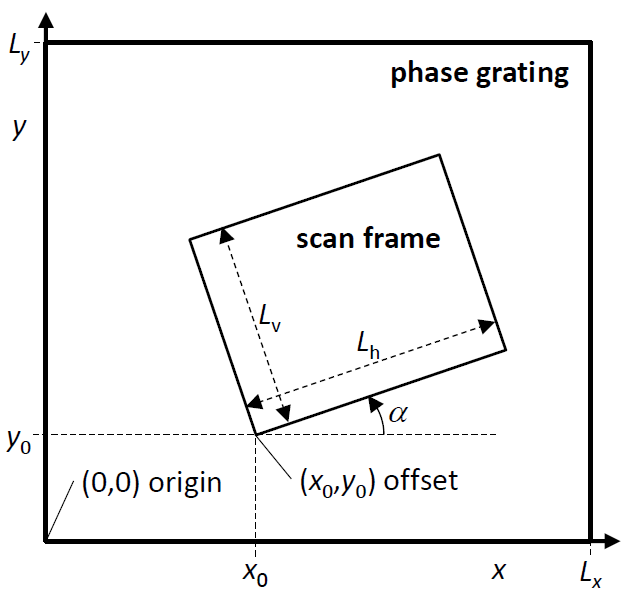 The scan frame parameters define size, sampling, and orientation of the scanning scheme applied in a STEM image simulation. The respective section of the calculation setup dialog provides input fields for the parameters and additional tools automating parts of the setup with reasonable defaults. Dr. Probe uses rectangular scan frames. The rectangular scan frame is defined by an offset point, by the frame size, and by the frame rotation. The frame parameters are in the coordinate system used to describe the wave function in the multislice calculation. All parameters are denoted in nanometer units with orientations in degrees. Notation of rectangular scan frames: A rectangular scan frame is defined by an offset (x0,y0) with respect to the lower left corner of the wave function, by a scan row length Lh, by the scan column length Lv, and by the rotation angle alpha between scan rows and the x-axis of the wave function. The frame offset is the first scan position and corresponds to the lower left corner of the scan image. Note that orientation of the scan image described here differs from the typical experimental orientation, where the scan image is built up from top to bottom. The scan frame offset can be defined by typing the coordinate into the respective edit boxes. Another way of setting the scan frame offset is by left-clicking in the object data display area, where the scan frame offset is marked by a thick white cross. The offset position defines also the stationary beam position when calculating images of the probe propagation and CBED simulations. Quick setup tools for scan frame offset and size are provided by three buttons. You can set the scan frame equal to the full slice size, or to half size	of the wave function with the option of centering the half frame or keeping its offset at the origin (0,0). The buttons labeled [Minimum] and [10 pm] provide quick ways of setting the number Nh,v of horizontal and vertical pixels sampling the scan frame. The minimum sampling provides just sufficient resolution based on the current setup of the coherent probe with Nh,v = 4 Lh,v qmax, where qmax = thetamax/lambda, where thetamax is the probe convergence semi angle. 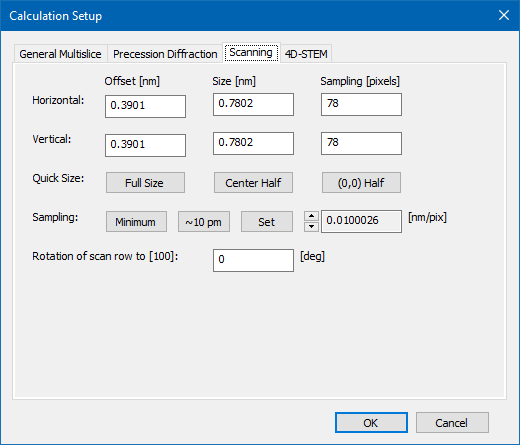 Although no additional information will be generated when scanning with finer steps, a quick way to setup 10 pm scan steps is also provided here. Often experimental images are recorded with around 10 pm scan step on microscopes with 1 Å resolution. The isotropic sampling rate can also be tuned by means of the attached spin control or by specifying its value via the [Set] button.